This week, the film of Simenon's Stranger in the House opens in London, starring James Mason and Geraldine Chaplin. The writer whom some other writers consider the greatest living French novelist leads a clockwork life in Switzerland, finishing a novel in 12 days. 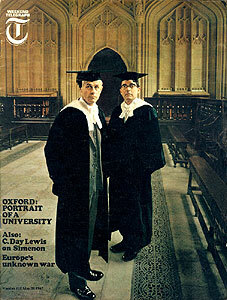 C. DAY LEWIS visited Simenon at home. "And now you must look at this portrait Vlaminck made of me." It is on the study wall, opposite the window. A painting in dark tones, depicting a desk on which lie a newspaper, a pile of books, a clay pipe, a huge tobacco jar, a revolver, and a bottle marked Poison. No one is sitting at the desk. The portrait is a private joke, symbolic of the creator of Maigret. AT 64, Georges Simenon has 191 novels behind him, nearly half about Maigret. I turn round to him. 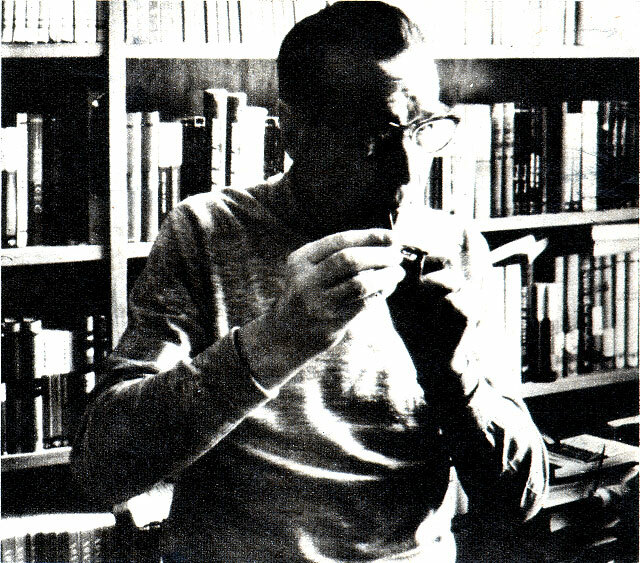 Georges Simenon is a man of middle height, 64 years old but looking ten years younger, shoulders stooped a little. His mouth, sloping down towards the corners, is sad in repose, but is often touched by an impish quirk when he talks: then the eyes, appraising, wary, light up with intelligence and relish. Beyond him, through the long window, I see a magnificent panorama: the Italian Alps, the Bernese Alps, the French Alps, all streaked with snow, and the Lake of Geneva steaming gently in the morning vapour. The room has a swept and garnished air  the feel of a room in an ideal-home exhibition, not one which is lived in. What is Simenon's taste? Impossible to judge, for this room strikes me as quite impersonal. Perhaps one can link this up with the way he writes, always objective, never seeming to intrude into his books, to give any suggestion of what he feels about a character. I looked in vain for some old, battered object, kept for association's sake, something eccentric or just in howling bad taste. The room, so light and airy, hints at his claustrophobia. Like me, he does not care to have mountains too close  they tend to move in on one when one's back is turned: and he cannot stand being on top of mountains  when he drives out of Switzerland, his chauffeur must use valley routes. He dislikes cocktail parties for the same reason. Simenon admits to claustrophobia. The man who cannot bear to be hemmed in risks becoming a lonely man. Of course the writer needs much solitude, by the nature of his calling. One way to preserve it is to organise a strict routine, which will be a barrier against unexpected or irrelevant demands, and against the wasteful mind-wanderings that dissipate one's energy. Out there in the grounds is the covered, heated swimming-pool which Simenon uses at 6.30 every morning of the year. The rest of his day is no less meticulously planned. If a writer cannot impose order in his own life, how can he create patterns from the chaotic life going on all around him? But the writer must break out of his home-made prison from time to time. Simenon's undertow of restlessness is evident. He sits at a desk, then gets up to stand by the window, then moves into one of the black-leather armchairs designed by Le Corbusier. It is a restlessness which has sent him travelling all over the world, impelled by the writer's inexhaustible curiosity ("to know what bankers are like, I must have breakfast with a banker in his pyjamas and dressing-gown"). Simenon is still a great soaker-up of impressions. "I feel like a sponge," he said to me. His friend, André Gide, called him the greatest of living French writers. We had taken a quarter-hour taxi ride from Lausanne up the snowy foothills to Epalinges. The white house he built there has a long central section, with two wings. I get the feel of luxuriously appointed impermanence which I have often received from the houses of the rich. But Simenon would dispel my sense of unreality. It was an act of great kindliness to receive us at all, for Mme Simenon was ill and had to be taken to the Lausanne clinic this afternoon. From the start his welcome was affable and forthright: unlike some best-selling novelists I have met, no trace of the prima donna about him. He showed us some of his collection of pictures, many painted by his friends,  Picasso, Matisse, Derain, Vlaminck, Dubuffet, the first Braque to show the touch of cubism. He has always preferred the company of painters to that of writers: they have more calm, more inner serenity. "I try to live with the truth of nature. With nature you cannot cheat." About his novel, The Little Saint, a study of a painter's childhood and youth, he wrote: "I have always been trying to exteriorise a certain optimism that is in me, a joie de vivre, a delight in the immediate and simple communion with all that surrounds me, and to attain, in order to describe such a state, to some kind of serenity." The joie de vivre is there in the occasional sunbursts of laughter which break through his talk: I am not so sure yet about the inner serenity. We have decided to converse in his somewhat unreliable English rather than in my still less reliable French. At a loss for a word, he gives a deep, delaying growl, to keep the ball in his own court. "You like everything shipshape," I suggest, looking round. He is pleased with the expression, and tells me how he lived for four years on his own boat. I say that, if I had not been a writer, I should have liked to be a sailor or a farmer; man's perennial contradiction  the wish to put down roots, the wish to pull them up and wander. He agrees enthusiastically, but adds that in fact he had run his own farm for several years. I turn to the cinematic quality of his writing  the economy, the pictorial vividness, the rapid cutting from scene to scene. "Did you learn this technique from the movies?" No, it was the other way round. In the Twenties he knew many of the most famous avant-garde film directors. "It was we who were always trying to change film technique, sharpen it, speed it up." Apart from television, Simenon has had 56 films made of his novels. He invariably hands over the treatment to the film-maker. At the moment his eldest son is making a film of one of Simenon's novels. And for the first time another novel Les Inconnus de la Maison, written in 1939, has been filmed in an English setting. Stranger in the House is a thriller, whose theme is the gulf between the generations. He never visits a theatre or cinema nowadays. Partly because he finds them claustrophobic, partly because he likes to go to bed sharp at 10 p.m. THE patriarchal side of him may well stem from his upbringing in a petit-bourgeois family  an upbringing sketched in his longest and probably best novel, Pedigree, which is at least semi-autobiographical and landed him in a number of libel actions. Simenon has converted the whole basement of the house into a vast playroom. I saw a jazz-band outfit  his eldest son, by his first wife, was taught by a drummer from Paris, and is now of professional standard. A doll's house. Physical training apparatus. This room is sound-proof. The compartmented life again? His children clearly mean a great deal to Simenon. I try to imagine him playing with them here, and do not quite succeed. Back to his own young days. "When did you start writing?" "As soon as I could think." His first novel was published when he was 16. He had had an early ambition to be a priest  it would give him time for writing, he thought. But his mother apprenticed him to a pastry-cook. After a very brief period in a bookshop, he became a journalist, and presently moved to Paris. In 1920 he started writing for a publisher of pulp literature, under the name of Georges Sim, to learn the craft. "I calculated, if I wrote one of these books every three days, I would have a yacht and a car by the time I was 28." And so he did have, but through the invention of Maigret. "My publisher thought the first Maigret would be a flop. He complained there was no problem, no plot, no love-interest: the characters were not divided into the good and the bad; it had an unhappy ending. But it was successful." "What drew you first to crime fiction?" "As a reporter in Liège I had to visit the courts and the police precincts. In Paris I studied police organisation." I said that, of the two greatest detectives of our time, Sherlock Holmes was the man of reason, Maigret the man of intuition. "Inventions are made by intuition, not intelligence. But I always think of myself as an artisan." "And one never perfects a craft?" "When you have mastered your craft, there is only one thing to do  die." "Has Maigret changed through the years?" "He used to have a thick moustache, a bowler hat, and a velvet collar." "Had he an original? Did you put something of yourself into him?" "Have you read Maigret's Memoirs?" I had not. Simenon gave me a copy, writing an inscription in it. Reading the book now, I come upon Maigret talking to Simenon: "D'you know that with the course of time you've begun to walk and smoke your pipe and even to speak like your Maigret?" 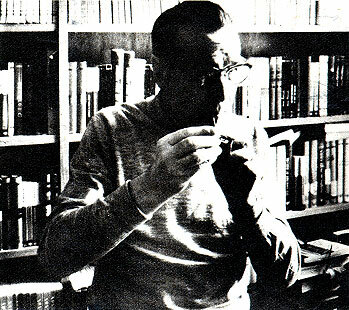 Simenon finishes each of his short novels in 12 days  seven days to write it, five for revision. The revision is done to cut out every superfluous word (he has a particular dislike for adverbs). Before starting, he compiles a factual list of characters: names, addresses, telephone numbers even. If he took longer than seven days to write the novel, he says, the characters would grow thin and lose their grip on his mind. He does not begin with a plot: he invents a group of people and lets them create the situations. He has written 191 novels under his own name, of which 71 are Maigret stories. He has a novel published in some language or other every day of the year, so he tells me. He has long ceased to feel astonishment at his own productivity, if he ever did. Did he always have the same supreme self-confidence? His working library is in one bookcase downstairs  volumes of medicine, psychology and biology. "I want to make people more biologically human," he says to me. He was particularly gratified by a fan letter from a doctor, which said: "Your people have a liver and a stomach". And now it is time to think of our own stomachs. Simenon recommends a restaurant in Lausanne. As he helps me into my ancient Connemara tweed overcoat, he fingers the weave with delighted, child-like pleasure. WHEN we return at 5 p.m., there is a glorious oranges-and-lemons sunset over the mountains. Simenon and I confess we were a bit nervous about the interview. "I can manage journalists all right," he says, "but with you  Gide once wrote to me, explaining why I had not had a letter from him for some time, 'I like to give you only the best of myself.'" I think he is a little tired. His gait is stiffer, and the growling which conceals his search for a word is more protracted. He may be feeling his age. In the old days he used to enjoy riding, diving, football, big-game fishing. Now it is golf only, and the swimming bath in the garden. He has shown me a room upstairs, with a table for massage, and fully equipped as a minor-operation theatre. The idea might seem grotesque. But Simenon points out that, with three children and a staff of nine, there is always some risk of an accident. The modern patriarch again. A full-time nurse in uniform stands by  she was probably the children's nanny once. The practical side of his nature comes out in the efficient management of things, not to prop up his ego, but so as to cause the minimum of friction in his private and public lives. If these two lives run smoothly, it is he who has laid the track (his timetable includes punctual stops for meals with his children). TIDINESS is a Simenon fad. Platoons of the famous pipes are on parade. 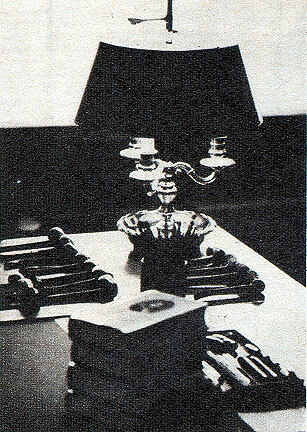 Simenon likes modern objects around him: modern pictures, furniture  and gadgets. He has an engineer's interest in gadgets: the clock which can be adjusted to show the time anywhere in the world; the clock which "works by light"; the two tie-stands which swivel round, offering a fantastic selection of ties carefully graded by colour. I ask about his other interests. Politics? A decisive "No. You can't keep clean in politics." He expresses contempt for political honours, like any angry young man. "They've given me ribbons  the Légion d'Honneur  that sort of thing. I gave them to my children to play with." "But you accepted them? " "Yes. To refuse would be" (long growling: he gives a friendly bawl to his secretary, the charming Miss Aitken, to come in and translate)  "ah yes, would be unnecessarily provocative, would be to make an issue of it." Reading? "Memoirs and Letters mostly now. I stopped reading modern novels at 28, when I started my serious writing. Other men's stories might get in the way of my own." Music? "I do not listen much. There is music all over the house  my children's radios and gramophones, but the rooms are well soundproofed. I like Bach. I once began learning the piano; but my teacher had such bad breath, I gave up." "What sort of person do you admire? Are you a hero-worshipper?" "I don't believe in heroes. Heroic deeds are chance. When I was a boy, I rescued my younger brother from drowning in the flooded Meuse. Every yard further I swam, I thought  if I don't catch him the next yard, I'll turn back. It was pure chance I did not. The hero is the person who has the courage to make a good thing of his whole life; or the man who lives 20, 30 years with a sick person." Simenon has none of the French intellectual's kind of sharpness, facileness, or surface paradox; he keeps his irony to himself. He is a man of instinct. At the clinic this afternoon he had encountered 20 patients who, he felt quite sure, had stories he could have tapped. He feels an almost physical response to people's troubles. In his fiction, he does not take sides for one character or another. He dislikes most contemporary French novelists because "they are moralists". "I believe I know which of the virtues you rate highest," I said. We go upstairs. Here is the chair in which he reads from 8 to 10 every day. Beside the bed is a row of narrow shelves: on the upper ones, a complete set of Stendhal; on the lower, a collection of toy animals his children have given him for birthdays. Here again, the modern patriarch. Children, manservants and maidservants, the flocks and herds of words. I felt a deep loneliness in him  an underground stream of sadness beneath the smiling surface. 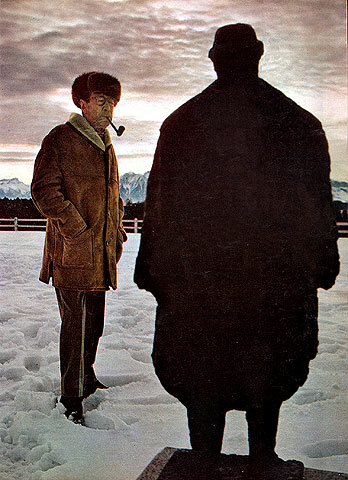 He spoke of friends who live nearby  Charles Chaplin, James Mason, David Niven. But I gathered that his closest friends live in less expensive places and he gets few opportunities to meet them. I think he guards himself from too great intimacy, from being too closely involved with people; and this suggests that beneath the affable surface he is shy and highly vulnerable. Simenon's greatest pleasure, he told me, is to go round his house at daybreak every morning, opening the shutters of the windows which overlook Lake Geneva and the mountains. Here is the gesture against claustrophobic life. And here is the basic optimism and outgoingness which have kept him buoyant. Who knows what a new day may bring? An idea for a book, a long-buried memory, a letter, a disaster. To interview a writer is like interviewing a haunted house. I was aware, with Simenon, of all the characters he had invented flitting between me and their creator: they are insubstantial things, fictions, yet in a sense more real than the man who gave them life. Good novelists are seldom striking "personalities". Their life is drained out and diffused through their creations. You could almost say that, in this luxurious house, it is Simenon the writer who is the ghost, having distributed his own being among the creatures of his imagination when he turned them into flesh and blood. I certainly got the impression that, more than most people even, Simenon is a man of contradictions. A fundamentally simple man, at the centre of a ménage which is affluent, elaborate and sophisticated. An excellent host, who nevertheless dispenses hospitality as it were on behalf of the absent owner, like a major-domo or confidential secretary. A man who enjoys all the possessions his talent has brought him, but still only half believes in them. A writer who, for all his strong vein of optimism and joie de vivre, has explored so consistently the seedy and the seamy. BUT the greatest contradiction emerged when he said to me, "I am more interested in man than in men". It seemed a paradox to which any novel of his could give the lie. A scientist, a philosopher, even a poet might say this. But a novelist? ... Yet I begin to see what was in his mind. The writer who will not take sides for or against any of his characters, as Simenon does not, is already half a scientist  more than half a clinical psychologist. This, together with his interest in biological processes, does mean that Simenon is concerned with the individual chiefly is a representative of the race. Simenon moves, dispassionate and disinterested, through the violent, commonplace or sordid scenes he depicts, asking each character "What have you to tell me about the human condition?" These characters and situations, so vivid, precise, concrete, cast on the wall behind them a giant shadow; and it is the shadow, always hanging, portentous, abstract, which for Simenon means "Man". A statue of the detective stands outside his creator's home near Lausanne.